According to a study published by Scientific Reports, researchers examined the bacterial biome of 14 varieties of common household kitchen sponges from private households in a town in Germany. The results were staggering: Hundreds of different types of bacteria were present on the sponges—even those thought to have been "cleaned." Although you could microwave, boil or bleach your (metal-free) sponges to clean them, these methods may not remove all the bacteria and, in some cases, could allow the worst of it to multiply. If you can't remember to (or don't want to) change your sponge weekly, a better option would be to use a new, clean and dry dish cloth every day and launder the soiled ones. There's nothing wrong with wanting to save calories and scrubbing time by using a little cooking spray as a substitute for butter or oil and to keep your foods from sticking to the pot or pan. However, you should know that some cooking sprays use butane and propane as propellants (in levels considered acceptable by the Food and Drug Administration) and that manufacturers are allowed to "round down" on calories in cooking sprays (they consider a spray less than one second, while most sprays are longer than this), so while a label may claim that the spray is "calorie-free," the reality is that there are seven calories in each one-second spray. Cooking sprays can also contain artificial ingredients, alcohols and other additives you might want to think twice about consuming. A better option would be to use an aerosol-free, glass oil sprayer filled with olive oil or another healthy oil. Sure, you may have gotten good use out of your parents' old nonstick pots and pans, but how much use is too much? Not only can the chipped coating from non-stick pans flake off into your foods, but Teflon (the brand name for the man-made chemical PTFE), a popular coating found on non-stick pots and pans, has been found to release toxic fumes when overheated. However, as long as you make sure to cook within your cookware's normal temperature ranges (be sure to read the manufacturer's instructions), you shouldn't worry about cooking with non-stick pots and pans, says Robert L. Wolke, Ph.D., and author of "What Einstein Told His Cook: Kitchen Science Explained" in Good Housekeeping. If you're still worried, consider a cast iron pan as a great alternative cooking tool choice, as it heats more evenly and becomes naturally non-stick with regular use. Although we go to great lengths to kill bacteria in our kitchens, there are times when some antibacterial chemicals, in this instance, triclosan, do more harm than good. Studies suggest the chemical, which is commonly found in soaps, can interfere with our hormones and may increase the risk of cancer, though more research is needed to be conclusive. In addition, in 2016, the U.S. Food and Drug Administration issued a ruling that companies can no longer market their products containing certain ingredients as "antibacterial" because no evidence was put forth that the ingredients were any more effective than regular soap and water for germ prevention. By now, you've all heard of the dangers of BPA and how it can disrupt your endocrine system, and how microwaving foods in plastic containers can cause the phthalates they contain to to leech into your foods as they warm, causing reproductive and fertility issues. Most plastic containers that are labeled "microwave-safe" can be used in the microwave without concern. Plastic containers that you have had for a long time that are scratched, cracked or have been microwaved over and over have more potential for leaking toxins. A better alternative is to store and reheat your foods in microwave- and oven-safe glass containers, you're not only saving yourself from possible health issues, but from washing double the dishes as well, as you can take glass containers from from fridge to heating element without transferring your foods to another dish. 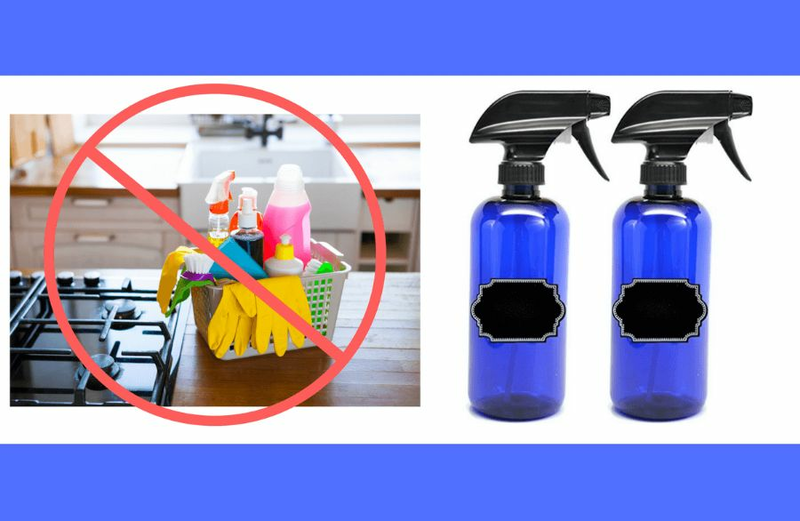 Why use potentially toxic kitchen cleaners when you can make your own out of products you probably already have around the house such as vinegar, baking soda, olive oil, Borax, castile soap and essential oils? All you're missing is a couple different spray bottles you can easily label, some newspaper for cleaning windows and some old (clean) towels or rags for wiping down other surfaces in your kitchen. Ah, breakfast time. Your favorite time of the day. After you stumble down the steps, rub the sleep from your eyes and turn on the coffee pot, you open the fridge to consider what to make for your first (and arguably most important) meal of the day. You grab the carton of eggs and set them on the counter, only to realize you never cleaned your omelet pan from yesterday's breakfast. You set about washing the pan, grabbing the kitchen sponge that's been living in the sink for weeks, squeeze out a dollop of antibacterial soap and get to scrubbing. There are some spots where the non-stick coating is coming off, but you ignore those places, grab a towel and dry the pan. A few sprays of non-stick cooking spray and a couple eggs later, you're well on your way to a wholesome, nutritious breakfast, right? Not so fast. In the eight minutes it took you to clean your pan and cook your eggs, you may have used several seemingly harmless kitchen items that could turn that healthy breakfast into a not-so-healthy meal. But what are they and are there products that would make smarter swaps for these common household items? Rest assured, we have your back. With just a few simple changes, you can take your kitchen from sketchy to safe.